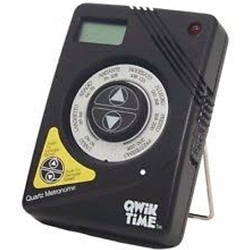 The Qwik Time QT-3 Quartz Metronome features a speaker that projects clear clicks that cut through the music. More than 200 speed settings, A440 tuning tone, low-battery indicator, and an earphone jack. Measures 3-1/2" x 2-1/2".